LOS ANGELES, California (CNN) -- Emmy Awards producers, struggling to keep viewers' attention, promise a faster-paced show with more entertainment Sunday night. 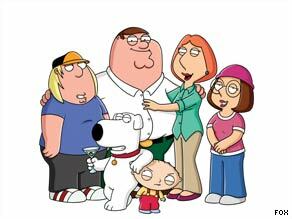 "Family Guy" is the first animated series to be nominated for best comedy since "The Flintstones" in 1961. Last year's show barely missed becoming the least-watched Emmys telecast, prompting executive producer Don Mischer to find ways to prevent it from becoming a "niche show that the majority of people don't want to watch." Mischer -- also known for producing memorable Super Bowl halftime shows -- has said the writing is on the wall for the Emmys unless the show is changed. What sort of surprises will the show have in store? Incidentally, Mischer wasn't the producer of the 2004 Super Bowl halftime show that ended with Janet Jackson's infamous breast exposure. He was hired to take over the next year, when the emphasis was on a controlled show. Nevertheless, the producer has teased viewers with promises of a "surprise opening." How will the producer speed up the show? Emmy presenters will pull double duty. One Mischer time-saving tool is to have each team of presenters announce two Emmy categories. This means half the time walking out and half the less-than-entertaining banter. It also means comedy awards will be grouped together, separate from drama awards. The idea of having each nominee already positioned onstage is unlikely since it created awkward moments several years ago when it was tried at the Oscars. It could be fun to keep a stopwatch handy to track how soon Mischer triggers the music to end the acceptance remarks for each category. Will he give the lead actor in a drama series more time than the dozen writers who accept the award for outstanding writing for a variety, music or comedy series? Will show writers grumble that they get no respect? Mischer's original plan to make the Emmys more watchable revolved around "time-shifting" eight awards -- including two writing categories. These would have been presented in the hour before the televised show began. About 50 seconds of each presentation would be shown during the live show, saving about 16 minutes of airtime that would have been used for more entertaining segments. This plan was scrubbed after writers revolted, complaining that there would be no shows to honor without their work. Watch for winning writers to say something about this in their acceptance remarks. Will host Neil Patrick Harris make viewers forget last year's awkward grouping of reality-show emcees? Mischer apparently hopes so. He's praised the "How I Met Your Mother" star as "easy and graceful under the pressure." Moreover, Harris can sing and dance, as he proved at the Tony Awards in June. The former "Doogie Howser" star and current Emmy nominee will be onstage more than the usual Emmy host, Mischer said. His job will be to move things along at a quick pace. Does "Family Guy" stand really a chance for best comedy series? Against "30 Rock"? "The Office"? "Flight of the Conchords"? Probably not. In fact, "Family Guy" creator Seth MacFarlane told The New York Times Magazine, "I would highly doubt it." But if the show does win, it'll be a first. Not even "The Simpsons" has taken home the big award. In fact, "The Simpsons" has never even been nominated for best comedy series -- the only previous animated nominee was "The Flintstones," in 1961. Will you enjoy watching people get trophies for three hours? All of the time Mischer saves with his changes are geared to make way for segments designed to make watching the awards marathon entertaining -- and to attract a broader audience. This should include references to TV shows that you like but would never be nominated. It's the producer's recognition that voting is done by television industry workers and does not necessarily reflect the tastes and opinions of the audience. Last year, 12.2 million viewers watched the show. Sure, people will pay attention to the celebrities gliding down the red carpet, but once the show begins, they may turn to the football game on NBC. Or the premieres of "Curb Your Enthusiasm" and "Bored to Death" on HBO. In fact, HBO might be doing some competing against itself -- once again, the cable network was the leading nomination-getter, earning 99 nods. Who will be deemed worst-dressed on the red carpet? If you find yourself talking about this Monday morning -- and not about the show itself -- then Mischer may have failed in his mission to entertain.